The hare broke cover at the corner of the rosemary patch and lit off. My dog lunged. The leash jerked from my hand and the chase was on. Yes, there is a clause in my farmland lease contract that stipulates I must keep dogs leashed at all times, but who can hold back nature? Red can’t help herself. And the jack rabbit; well he’s one of those twisted Lagomorphs who finds pleasure in danger. Don’t think “plump, naughty, little Peter Rabbit who sneaks into Farmer Griffin’s garden for a nibble of lettuce and then loses a shoe and a blue coat with brass buttons.” No; we’re talking about Peter’s brazen, shameless, wild-eyed cousin, Jack, who loiters in the herbs and eats my vegetables to feed his hunger for speed. Jack probably smokes Marlboros when he’s filling up at the gas pump too. He’s that kind of bad, bad bunny. I raise rosemary because the herb complements the potatoes I grow, both on the plate and in the field. Rosemary is a perennial. I need my farm-scape to display a patchwork of short term annual crops, like carrots, and longer term annuals, like tomatoes, mixed with permanent, perennial crops. That way, when our tractors are turning under one block of soil, the beneficial insects that live on the farm, like ladybugs, always have a place to take shelter that’s close by. If I turned all the soil over at once, or even if I turned it all over frequently, I’d break the life cycles of the beneficial insects and scare off the birds that I need as allies. Of course, no system is perfect. So the rosemary patch which theoretically gives cover to the quail that eat the ants that would otherwise carry aphids to the cabbages- well, crazy hares live there too. I could shoot Jack, I guess, but that would make Red sad. She loves the chase. Jack scampered down the dirt road that runs along the levee at the edge of the farm. True, with two hops he could’ve cleared the levee, then dashed down into Pacheco Creek and lost the mutt in the riparian thicket, but where’s the fun in that? Besides, Red was doing well. It’s been a dry winter. The dirt road was hard-packed, without the dust that comes with the heat of summer. Red had muscle, drive…. and traction. Jack looked in his rear view mirror, saw the dog gaining ground, and eased into second gear. Red stretched her legs out. 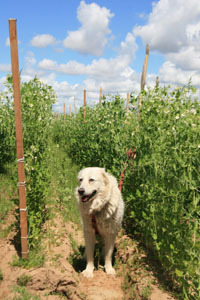 Jack laid his long ears back just a little and executed an instantaneous, 90 ̊ hard left turn into the fava bean patch. But this wasn’t Red’s first race down this track. She cut the corner off the right triangle with a vengeance and ripped a hellish hypotenuse through the beans. Besides being a dry winter, it’s been cold. We got the fava beans in on time, but the persistent low temperatures throughout December and January stunted the crop’s growth. So now, at a time when our earliest sowing of fava beans are usually a good three to four feet tall, we’ve got long rows of plants that are only two feet tall. I couldn’t get too mad at Red for trashing some beans; I’ll probably turn them under for fertilizer rather than harvest them anyway. We’ll pick our fava beans from the plantings that were sown recently under warmer conditions. The Jack rabbit passed through the favas and headed out into a large block of ground planted in a cover crop of oats. This was our last cover crop to go into the ground and the oats are only three inches tall. When they’re three feet tall in April we’ll turn them under to add carbon to the soil, then plant the piece out in tomatoes and sweet peppers, but right now the field looks as well-groomed as a golf course, the soil level, smooth and firm. It was a beautiful sight; the buff-colored hare, his long, black-tipped ears cocked back to 45 ̊ now, running smoothly, hitting on all eight cylinders across the manicured green; the fluffy, white dog racing at full speed under blue skies, running as if it were her life that depended on a first place finish. Our field of young oats doesn’t go on forever, and the bunny knows this better than anyone. There’s a pond at the edge of the field. Jack doesn’t like to swim. So before he hit the water he hit the brakes and did an amazing 90 ̊ left, followed by another immediate 90 ̊ left– a perfect 180 ̊ keyhole turn– and passed Red at a terrific clip, going in the opposite direction. The dog took a frantic turn, went into a sloppy drift that sent turf flying, dug in anew and hit the gas. Jack was way ahead for the moment, but moving into broken ground, a spent patch of rapini, recently plowed, with lumpy clods that are rough on the paws. The dog, with her longer legs and bigger feet, did better on the blocky ground and was making up for lost time. But wait! What’s this! All the hopped up kinetics and the “hare-pin” turns seem to have molested the gang of fleas that live behind Jack’s ears. The fleas are digging in and holding on for dear life, and the itching is driving Jack mad! He has to stop and scratch! But Red is protected from fleas by FRONTLINE PLUS for dogs©– she ought to have a decal on her bumper– and she’s catching up. She can almost see the checkered flag! But Jack punches it out of the pit, floors it, gets to sixty in two seconds, makes an evasive maneuver under the picnic table where Nato, the tractor driver, eats his lunch, dodges a pile of sprinkler pipes and two trash cans, crosses the work area where Rogelio is scrubbing radishes, and makes a hard left on to the straightaway by the spring crop vegetables in the front field. Red is slowed by the obstacles. And her feet hurt now after scrambling over all those big clods. But Red reaches deep for one more burst of speed and flies past Rogelio, barking in rage. So Jack pops it into fourth gear, and pours on the coal. There are flames shooting out of his tail pipe now and his ears are flat back. He’s hot-rodding for the San Benito County line like a good ‘ol boy running white lightning, the rows of lettuces, cauliflower, broccoli, and beets all blurring together into a green mist. 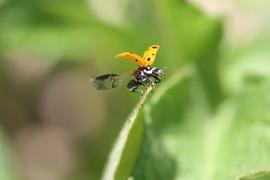 © 2012 Article & Photos of Ladybug alighting and of Red by Andy Griffin. Photo of Jack Rabbit by Jim Harper. I’m hoping to raise a thousand dollars for the Big Sur Land Trust to have on hand to help school districts and youth groups transport kids to visit these properties for outdoor education. It’s not enough for us to buy land for parks, or pay for scenic easements, or preserve our watersheds and farm lands through conservation easements. If future generations of kids coming up here don’t have a sense of connection to the lands that sustain them, if they don’t learn to feel a sense of community with the plants and animals of the land, if they feel no kinship or interdependence with the farmers and ranchers and foresters that maintain the land, then our future is in jeopardy. There are a lot of children who don’t have an opportunity to visit parks and farms and ranches. Schools are in trouble and they can’t afford field trips. The Big Sur Land Trust is acting to span that gap between our social needs and our public resources. Help be a bridge. The vegetarian meal will be prepared at Happy Girl Kitchen in Pacific Grove by John Madriaga. John is a Manresa alum, who has worked at the world-renown Noma, in Copenhagen, and he is currently sous chef at Spruce in San Francisco. Happy Girl Kitchen is charging $55 dollars for the meal. I’m asking for an extra $20 per plate as the benefit contribution to the Big Sur Land Trust. I’m donating all the produce from my farm for the event. Carmel Valley’s Heller Estate winery will be pairing wines for each course for an extra $20 dollars. You can sign up for the meal at Happy Girl Kitchen. Dinner dates are Friday, March 16th OR Saturday, March 17th. Inform yourself about the Big Sur Land Trust and its mission. Here’s a link to a story about one of the youth groups the BSLT has hosted on the land at Glen Deven Ranch. Take a look at some of the pictures I’ve taken on the Big Sur Land Trust properties at the I-Heart-Big-Sur-Land-Trust Facebook page. If you can’t make the meal, consider making a contribution anyway and write a check to the Big Sur Land Trust and send it to Shelley at Mariquita Farm, P.O. Box 2065, Watsonville CA, 95076, and we’ll see that it gets bundled with all the other donations from the meal and delivered to the Trust.